Bret Michaels' sister says her brother is sounding like himself after suffering a brain hemorrhage. 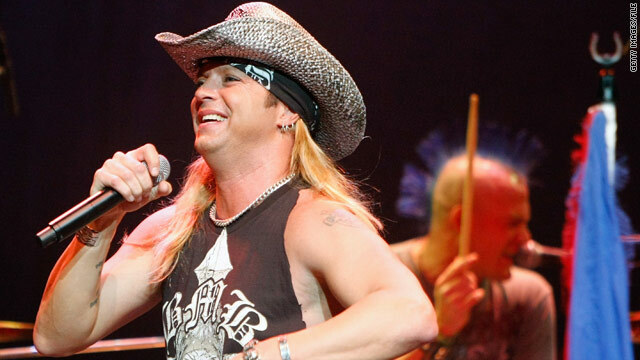 Michelle Sychak, Bret Michaels' sister, told a radio show that her brother "seems very coherent"
(CNN) -- Bret Michaels "sounds like Bret" nearly a week after suffering a massive brain hemorrhage, his sister told a radio show Wednesday. "He sounded good -- as good as you can when your brain's throbbing," Michelle Sychak said in a interview with the "Todd N Tyler Radio Empire." "He seems very coherent to me and like he knew what he was saying." Michaels' recovery is going well enough that his concert tour could resume in a month, according to a statement on his website. The rock singer and reality TV star, hospitalized since last Friday, is in critical condition in an intensive care unit, his road manager said. Doctors will "explain his condition, treatment and prognosis" at a news conference next Tuesday, according to a statement posted on his official website. His sister's call to the Omaha, Nebraska-based radio show was one of the few times a family member has spoken publicly about Michaels' illness. "He's doing good," she said. "He's not by any means out of the woods, but he is getting better every day." Road manager Janna Elias, who has been posting daily updates for fans on Michaels' official website, wrote Wednesday evening that his band could resume its tour in a month. Elias said the plan is for Michaels' tour to resume May 26 in Fort Smith, Arkansas, "provided there are no further complications or setbacks." "Even though yesterday was a minor setback, doctors remain hopeful for a full recovery and plan to release more specific information next Monday," Elias said. Tuesday's statement from Elias disclosed that Michaels suffered a side effect from the brain hemorrhage called "hyponatremia, a lack of sodium in the body which leads to seizures." Doctors still have not pinpointed the "exact cause of the rupture" in Michaels' brain, she said. "He is responding well to tests and treatments," Elias said. Doctors told Michaels "is very lucky as his condition could have been fatal," she said. "With further testing and rehabilitation, they are hopeful that Bret will gradually improve as the blood surrounding the brain dissolves and is reabsorbed into his system, which can be a very painful recovery and take several weeks to months," she said. Michaels, 47, was hospitalized Friday after suffering the hemorrhage. Citing security reasons, his manager and publicist have not disclosed the hospital or even the city where the singer is being treated. Michaels was the lead singer for the '80s glam-metal "hair band" Poison. He became a reality star by headlining the VH1 show "Rock of Love with Bret Michaels." He has also appeared on "Celebrity Apprentice."